Die dritte Inkarnation des Galaxy Tab 7.0 ist verfügbar. Den Vorgänger gibt es zum stark vergünstigten Preis, der aber immer noch leicht über dem etlicher Konkurrenten liegt, die zudem besser ausgestattet sind. Eine 1-GHz-CPU und 512 MByte RAM sind nicht mehr zeitgemäß. Als Unterhalter und Surfmaschine (3G-Version erhältlich) taugt es aber dennoch. Größter Vorteil gegenüber dem Gros der Konkurrenz: die lange Akkulaufzeit. Overall, for £200 the Samsung Galaxy Tab 2 7.0 is a decent tablet. It boasts a sturdy, visually pleasing design and decent battery life. The big problem is, the Galaxy Tab 2 7.0 isn't as good as Google's Nexus 7, which retails for the exact same price and features a more powerful processor and up to date operating system. The Samsung Galaxy Tab 2 (7.0) for Verizon Wireless remains a classy and agile Android tablet, and LTE makes it better. Yes, it's more expensive than the Nexus 7, but it's less expensive than a Nexus 7 plus an unsubsidized hotspot. For anyone looking for a solid Android tablet that can connect to the fastest 4G LTE network on its own, the Samsung Galaxy Tab 2 (7.0) on Verizon is definitely worth a look. Overall it looks as if the Nexus tablet has got its main competition licked, although like every new player in this market it will struggle to take on Apple's iPad. Perhaps it's just down to Microsoft and its Surface tablets to challenge the Cupertino giant. 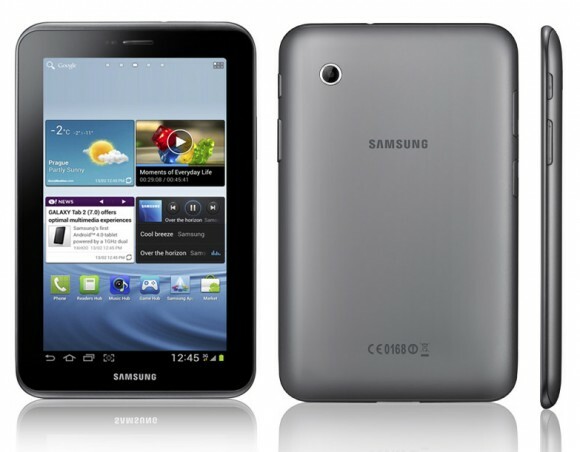 The Samsung Galaxy Tab 2 310 is priced at Rs. 19,900 (MRP). Besides the camera, Samsung has managed to get everything correct with the Tab 2 310, including the price tag. Currently, in this price bracket, there’s not much to compete against it, so if you’re looking forward to purchasing a portable 3G tablet under 20k, look no further than this one. If we are judging this in terms of being the best tablet on the market, well, this is definitely not it. We'd say that it is not even the best Samsung tablet on the market with the Samsung 8.9 still T3's preferred choice. If you are after a 7-inch Android tablet for under £200 though, this is a decent all-rounder, that may lack some of the gloss from its more expensive Samsung Galaxy Tab compatriots, but has Android 4.0 out of the box, a decent battery life, and a strong, sturdy build to make it worth investing in. Samsung has done well to pack a fast, fun, and useful package into such a slimline case. The screen is good, but could be of a higher resolution, and the back cover is a little slippy for our liking. Overall, though, the Samsung Galaxy Tab 2 7in has much to offer and is a great budget choice. At this price, though, we can’t help but have a soft spot for the diminutive Tab 2 7.0, which we feel strikes the perfect balance between price, performance and usability. Now all we need is for other manufacturers to be brave and start dropping the prices of their tablets too. If I was in the market for a budget tablet today, this is probably the one I would buy — although I suspect I’d also install CyanogenMod or another custom ROM to get rid of TouchWiz as soon as the first custom ROM with full hardware support is released. The Samsung Galaxy Tab 2 7.0 delivers good performance, a sleek design, and plenty of cool extras for an affordable $249. And unlike the Kindle Fire, you get expandable memory, access to more apps and dual cameras. The Peel app adds a greater level of functionality when using Tab while watching TV. While we wish the content-purchasing experience was less fragmented, those looking for a purer Android experience than the the Kindle Fire will find the Galaxy Tab 2 7.0 to be a strong value. Alas, some of the same problems facing older Android 3.2 "Honeycomb" tablets still remain here. There are still few tablet-specific Android apps, and they're not easy to find in Google Play (formerly Android Market). Hopefully, developers will start to write apps for Ice Cream Sandwich, which handles phone and tablet screen differences far better than any previous Android iteration. For now, Apple remains the app king with more than 200,000 third-party iPad-specific programs. This device is one of Samsung’s undeniably vast number of tablets they’ve got on the market right this second. Compared to the Galaxy Tab 7.7, it’s not nearly as impressive, but also not nearly as costly. This tablet is made to be inexpensive enough for anyone to afford while it keeps many of the features and elements that make a Samsung tablet experience one to look forward to. And best of all, the price on this beast is one to look forward to: $249.99 with no contracts for data to speak of! All that on the 22nd of April – that’s coming up quick, get your wallets out! It might be priced like a pocket money product, but the Galaxy Tab 2 has the DNA of Samsung’s full-fat, full-priced tablets. The 1GHz processor is plenty powerful to keep Ice Cream Sandwich zipping along, and both audio and video are reliable – if never exactly exciting. Only patchy apps and the lack of a well-integrated store is keeping the Kindle Fire ahead on our tablet wish list. We get hands-on with Samsung's new affordable Android tablet, the Samsung Galaxy Tab 2 (7.0). Kaum Fortschritte. Samsung legt seine erfolgreiche Galaxy Tab-Serie neu auf und bringt unter dem Namen Galaxy 2 je ein 7.0- und 10.1-Zoll-Gerät mit Android 4. Mit aktuellen Top-Geräten können die aufgefrischten Galaxys allerdings nicht mithalten. 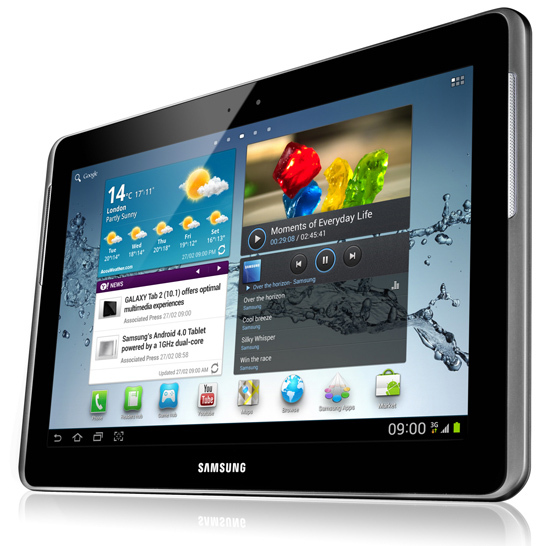 The Galaxy Tab 2 10.1 is available with 16GB or 32GB of onboard memory and you can add up-to 64GB more using the Micro SDXC card slot at the top of the tablet. Having this memory card slot means it's probably more cost effective to buy the 16GB model now and upgrade storage later. You can also buy a 3G model, which costs around £100 more for than the equivalent Wi-Fi model. The Google Nexus 10 is an incredibly well built tablet with a bargain, price thanks to the hit Google are prepared to talk in order to attract customers to it's Android Play store. This makes it a bit of an unfair fight from the off, as although the two tablet's RRPs are not a million miles from each other, if Google wasn't subsidising part of the cost there really would be a big gap. So it's a bit of a no-brainer to suggest buying the Nexus 10 if you can afford it. We love the bright screen, SD support and 1080p video capture of the Galaxy Tab 2 10.1. The problem is that the competition has moved on, and £299 is no longer a budget price for a 10 inch tablet. You could do a lot worse than the Tab, but also consider the Asus Transformer series, and the Toshiba AT300 which at only £30 more offers a quad-core processor. We award the Tab three and a half stars. It seems strange to see a new tablet that hasn't changed too much from its predecessor which perhaps best describes the Galaxy Tab 2 10.1. Having got thicker and heavier, the specs are mostly just the same. If you are after the best Android tablet, there are definitely cheaper alternatives out there and a few of them can be found in the Asus camp. If you're looking for a bog-standard Android tablet experience then it's worth considering, but you may want to check out the Asus Transformer Pad 300, Toshiba AT200 and Acer Iconia Tab A200, which offer strong competition to the Galaxy Tab 2 10.1. With Asus’ 32GB Transformer Pad available for £399 complete with quad-core CPU, 8Mp camera and keyboard dock, and the smaller Nexus 7 soon to hit the market for £160, the Galaxy Tab 2 isn’t quite cheap enough to make a compelling case for itself. It’s not a bad device per se, though. Indeed, as little as three months ago I would have rated it more highly. But how much Android tablet you can expect and for how little money is changing with dizzying speed. Yesterday’s good is today’s average, is tomorrow’s also-ran. The overall computing power and the good built quality (display, audio) are largely sufficient to perform the usual tasks for work – email, calendar, web browsing, video conferencing – and for entertainment – social network apps, video and audio playback, drawing. The Samsung Galaxy Tab 2 10.1 is a fairly good choice for people who want to save $100 to $175 (32 GB models) on the purchase of a secondary computing device. This tablet is made for those ladies and gentlemen who want the $100 discount off the lowest price on the newest iPad. Though this tablet is not made specifically to compete with the iPad, and it really wont, you’ll find it to be amongst the best values in the Android world for those of you not looking for the best processor on earth. If you just want to watch movies and browse the web, this may well be your best bet on the market today. With the addition of a microSD card slot and moving the speakers to the front of the tablet, Samsung has made some nice improvements to the Galaxy Tab 2 10.1, all while keeping the price below $400 and the battery life really long. Our favorite feature is the ability to use this slate as a smart remote. Overall, the Samsung Galaxy Tab 2 (10.1) costs too much for the mediocre performance it delivers. The Galaxy Tab 2 (7.0) is a good deal at $250, offering a host of useful features for its budget price. But with the Asus Transformer Pad TF300 and Apple iPad 2 both in the 10-inch mix, the Galaxy Tab 2 loses out falling short in both performance and app selection. If you have to have a Samsung tablet, go for the 7-inch Tab 2, or hold out for the Galaxy Note 10.1, which is expected later this year. If you need integrated LTE, the Galaxy Tab 7.7 ($699.99, 3.5 stars) is one of the most elegantly designed tablets around, but it's also one of the priciest. We get hands-on with Samsung's new affordable Android tablet, the Samsung Galaxy Tab 2 10.1. 3D Spiele sind auf diesen Vertretern nur in Ausnahmen spielbar, grundsätzlich sind die Grafiklösungen hierfür jedoch nicht geeignet. Office Programme und Internet surfen dürfte jedoch ohne Problem möglich sein. unknown: PowerVR SGX540: » Weitere Informationen gibt es in unserem Notebook-Grafikkartenvergleich und der Benchmarkliste. OMAP 4430: SoC mit zwei ARM Cortex-A9 Kernen mit NEON SIMD Engine, integrierte PowerVR SGX540 Grafikkarte und Dual Channel LPDDR2 Speicherkontroller. 74.85%: Diese Bewertung ist schlecht. Die meisten Notebooks werden besser beurteilt. Als Kaufempfehlung darf man das nicht sehen. Auch wenn Verbalbewertungen in diesem Bereich gar nicht so schlecht klingen ("genügend" oder "befriedigend"), meist sind es Euphemismen, die eine Klassifikation als unterdurchschnittliches Notebook verschleiern.» Lesen Sie auch unsere Notebook-Kaufberatung.